At around 10pm on May 18th, Deputy Todd Frazier was on a remote stretch of highway with police K9 Lucas, when he noticed a vehicle in a deserted rest stop. The officer decided to get a closer look and it appeared as if the driver was unresponsive. Frazier, got out of his car to check on the man, but soon realized the person in the vehicle was not alone. Two other men, materialized from near by and the 3 offenders began attacking the officer. They assaulted the officer and with a box cutter to his throat, proceeded to drag him into the nearby woods. Luckily, Deputy Frazier was able to activate an automatic remote control, which opened the car door, and freed his K9 partner Lucas, providing Frazier with life saving back up. The black Belgian Malinois did not let him down. He jumped into action and turned the tables on the attackers. The three males ran for their car and were able to get away. Lucas was covered in blood. At least one, and possibly more of the assailants will have bite marks. Both Frazier and Lucas incurred moderate injuries during the attack and are expected to make full recoveries. There is a $2500 reward for information leading to the capture of the three males that assaulted Deputy Frazier. If you have information that you would like to report, please call the Hancock County Sheriff’s Department at (228)255-919. Hancock County is small and Frazier’s squad car is one of only 2 that were recently installed for K9 units. To see more about how the device works watch this video. 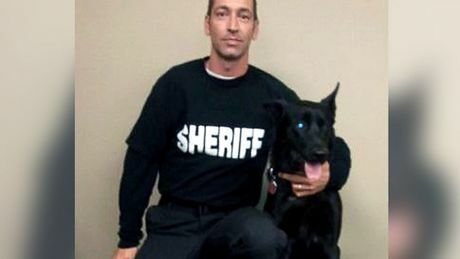 Deputy Frazier trained Lucas himself and is described as an excellent dog handler by Hancock County Sheriff Ricky Adam. Deputy Frazier might not be here if it wasn’t for new technology and a faithful K9. Lucas receives an award from P.E.T.A.